All cut & color services are guaranteed 3 day after initial visit with original service provider. Recommended for mature and prematurely aging skin. Smooth, soften and revitalize your skin with this advanced treatment utilizing plant stem cell technology enzymes, and peptides. After the treatment, your skin is left looking lifted, hydrated, and lustrous. Recommended for acne-prone or congested skin. Target existing breakouts while drawing out impurities and refining texture to fight future flareups. Enzymatic exfoliation softens and preps skin to clear debris from follicles, followed by a clay treatment mask to draw out excess oil. Medicated ingredients purify the skin, reduce bacteria, as well as irritation (facial extractions completed on an individual basis). Recommended for dull, uneven tone and texture. Not recommended for very sensitive skin or acne- prone skin. Revitalize tired, dull skin from the inside out with a powerful blend of antioxidants, brighteners and moisturizing agents designed to treat hyperpigmentation and uneven tone resulting in a more luminous complexion. This treatment includes gentle exfoliation, relaxing massage, and a nourishing mask. Your day looks brighter already! Recommended for all skin types, including dry skin, uneven tone and sensitive skin. 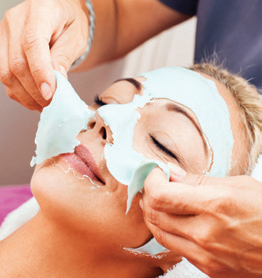 This signature facial introduces you to Glo-Theraputics professional skin care. Your skin therapist will customize the treatment based on your skin type and concerns, focusing on your skins specific needs while incorporating massage techniques for deep relaxation. Nourishing and reparative ingredients help reveal a softer, revitalized complexion. Recommended for all skin types including sensitive skin. Perfect for first time peel clients. Recommended for acne prone, uneven tone and texture, and aging skin. Not recommended for clients allergic to aspirin. Recommended for uneven tone, aging skin, acne prone an ingrown hairs. Recommended for dull skin, fine lines, superficial scar tissue or acne marks, uneven tone, aging skin, acne prone skin. By providing the strongest level of exfoliation within the glo-therapeutics line, this versatile treatment creates dramatic change in the skin. During this appointment we determine your shape & color, discuss the healing process according to your skin type,and apply your first treatment to the eyebrows. A 2nd application will be necessary 6-8 weeks later. At your second appointment (6-8 weeks later) we will reapply the color to your original strokes and further perfect the brow shape and color where needed. If dramatic fading has occurred at your first session, the second session will now take much better in the skin. If a third session is needed, it can be done 6-8 weeks later to further reinforce color. Additional sessions are not always necessary, however they are most common for those with problematic oily or dry skin, have little/no natural brow hair present, or did not follow their Pre-Care/After-Care as directed. Touch-up time will vary from client to client, depending on skin type, environmental exposure, and body chemistry. Reflexology is a natural health treatment where massage like pressure is applied to specific areas of the feet or hands. This pressure, when applied creates a reflex arc sending electrochemical messages to the central nervous system via the nerves and then to the organs and systems of the body to promote balance and healing. Permanent Eyeliner is a 2-3 step process, depending on your skin type and how the application heals in the skin. Fees are provided at the consultation on a per case basis. A patch test is required for proper matching of the surrounding natural skin tones. The patch test is done at the consultation for a fee of $50.00. A healing period and final color analysis occurs and if satisfactory, then 30 days later the camouflage procedure takes place. Skin tone camouflage for scars, burns, stretch marks, surgical incision scars etc., is generally a multi-session process, and fees per session may be assessed depending upon the complexity of the situation. SWEDISH MASSAGE Swedish Massage is often referred to as the “relaxation massage “ your massage therapist will use light to firm pressure with a range of long, smooth strokes. DEEP TISSUE MASSAGE Deep tissue massage can release the chronic patterns of tension in the body through slow deep strokes on any contacted areas. It is called deep tissue, because it also focuses on the deeper layers of muscle tissue. It can help reduce pain, increase range of motion, relieve muscle spasms and improve circulation. PRE-NATAL MASSAGE Pre-Natal Massage is a special type of massage tailored specifically to the needs of pregnant woman. Many woman find that prenatal massage helps to minimize stress, promote relaxation and help with lower back pain. Prenatal massages are done only by specially trained therapist who have received prenatal massage training. Pregnant woman seeking a prenatal massage MUST have a doctor’s note and must be at least 12 weeks or more along. Pregnant woman are not candidates for hot stone or aroma therapy. HOT STONE THERAPY Relax and melt away tension with a hot stone massage. This will help relieve sore muscles and release tension by relaxing the muscles. Heat also helps expand the blood vessels so that blood can circulate through the lymphatic system to rid the body of toxins and help it mend. REVIVING FOOT SCRUB Tired feet and legs find relief with our Reviving Foot Scrub. This helps muscle tissue to soften and pores to open. Once the scrub is removed, your therapist will moisturize the skin and work deeper into the muscle tissue of your tired feet and legs. Referral Points are a value of $1 per 1,000 points. Clients are rewarded 15,000 points ($15.00 value) for each referral. Referral points are not given for Bridal parties and large parties. Points can not be used with any other discounts.  At Andrew Marke Salon our staff guarantee their cutting and chemical services for three days after your visit with your service provider. Andrew Marke Salon is not liable for any hair extension services that are not properly maintained outside of the salon. Many products on the market strip both color and permanent wave from hair. We recommend purchasing professional products from our salon to validate your service guarantee.ve from hair. We recommend purchasing professional products from our salon to validate your service guarantee. Retail products may not be returned unless defective. All electrical appliances have a 10-day salon warranty. After 10 days the manufacturer’s warranty is in effect.